I am writing this letter to bring to your attention and that of the Swedish government the seriousness of the situation in the Iraqi city of Fallujah and to express views about Swedish action in this conflict. I feel deeply concerned about the terrible situation in Iraq. I am writing to you and the government because I am very worried about Sweden´s Iraq policy. The views I am expressing are my own, but also those of the Iraq Solidarity Association. “Fallujah cannot become a new Ramadi”, writes the International Red Cross in a statement about the growing humanitarian crisis. A sack of flour costs 850 US dollars, small children are starving and people are eating grass in the encircled city. Ramadi “was liberated” by being destroyed. The civilian population of the city are internal refugees. The bombs of the US-Coalition contributed to death and destruction. Fallujah was seized by IS roughly two years ago and has since then been bombed by the government. The US-Coalition has also bombed the city for 22 months. Almost 4000 dead civilians have during this period been brought to the Fallujah General Hospital, now the only hospital in Fallujah. Many of the staff have fled and the lack of medicines is great. The hospital is partially destroyed by the government´s attacks. For months the city has been encircled by US-trained government forces with military advisors from both the US and Iran and of feared pro-Iranian, uncontrolled para-military forces. These are committing crimes against international law of the same sort as IS: imprisonment, murder, torture and ethnic cleansing. The severe war crimes and crimes against human rights being committed by IS, both in areas they control and against innocent civilians in many Iraqi cities, must not hide or diminish the crimes of the US-Coalition, the government or the militia. A real victory over IS requires even the participation of the Sunni population. Without them Iraq cannot be unified and achieve national reconciliation. The people who are trying to flee from Fallujah are being shot at by IS and wind up in the hands of the sectarian militias, who separate boys and men from their families and take them away. The presence of the militias hinders the participation of the Sunni population in the fight against IS. Terrifying stories of murder and torture are retold by refugees -and other organisations that take care of traumatised refugees- frightened to death of both IS and sectarian militias. These include the infamous Badr militia that with the good memory of the US spread death and destruction among Sunni Muslims and other opposition during the occupation years. They now control Iraq´s Ministry of the Interior. On the 6th of June the UN High Commissioner warned about the illegal attacks on those fleeing and demanded that the perpetrators be held accountable. Even the population of Mosul fears the coming attempt to take the city. It has been terror bombed for a long time by the US-Coalition and the government. Infrastructures, such as electricity plants and water facilities, essential for the civilian population, have been destroyed. On the 19th of March this year the US-Coalition bombed the University of Mosul and killed 95 civilians, including many teachers and their families. A hundred people were wounded. Prime Minister Abadi as we as the Chief of the Badr miitia have announced that the militias shall participate in “the liberation” of Mosul. It is obvious that Iraq, as a consequence of the US invasion and occupation in 2003, is a collapsed state with a dysfunctional regime where no institutions function. Enormous contradictions exist within the ruling political class. The population has had enough and has shown it in massive demonstrations throughout the country since 2011. Now recently the Iraqi parliament was taken over by overwhelmingly Shiite, dissatisfied protesters. Four demonstrators were shot to death. The protesters blame the government for the lack of security: the poor in Sadr City, in Shiite market places and neighbourhoods are exposed to terrifying attacks from i.e. car bombs. The Assistant UN High Commissioner for Human Rights, Kate Gilmore, underlines that “the country is politically paralysed” and warned the international community of being “co-responsible” to the Iraqi government´s disinterest in the suffering of the Iraqi people, of not having a plan for the future and on only focusing on war. In her report after a recent visit to Iraq she stressed that Iraq needs a “competent and committed government for national unity”. Political and diplomatic solutions are needed for all of Iraq´s people, and she regretted the Iraq´s internal refugees are getting too little international assistance. We in the Iraq Solidarity Association, like you and the government, want to combat the bloodstained discredited IS- warriors. Many well-known Middle East experts reject however mass bombing as a method to destroy IS, while the US stresses that “the war on terror” may continue for decades and escalates its military presence in Iraq. It is primarily the civilian population which is afflicted with death and destruction from the air attacks. Many we-known commentators have quoted the Roman Senator Tacitus: “They create a desert, and they call it peace.” They believe this is what the US bombing is achieving. In the government proposal on “The Continued Swedish participation in the military education contribution in northern Iraq” the government provides clear support for the US-Coalition bombings. “They have been a pre-condition for the Iraqi Defence Forces and those armed militia allied with them – the so called Popular Mobilization Units – being successful in liberating parts of Iraq from ISIL”, writes the government which is conscious that parts of the armed forces and the militias commit war crimes against the civilian population. In the Foreign Policy Committee Proposal (2015/16:UU12) it is stated that the Committee supports “the international Coalition against Daish and welcomes that Sweden is part of the core group of the coalition”. The Pentagon has recently expressed that it is acceptable with 10 dead civilians. Far more civilians are being killed, but there is total silence in this question and denial on the part of the US. There is also total silence about the enormous destruction of infrastructure. During the 2003-11 occupation the US committed all kinds of conceivable war crimes. No responsible person has been made to face charges. International law is not applied to the US. It is difficult to believe that the people of Fallujah now welcome these new bombings of their city, which the US to a large extent destroyed in two massive attacks in 2004, when thousands of civilians were killed. Collective punishment is a war crime! Terror bombing can never contribute to a solution of Iraq´s problems. Is it reasonable to believe that Iraq´s people welcome bombings carried out by the state that enforced devastating sanctions and destroyed the country during the Gulf War and that was in the forefront for the illegal invasion and occupation? Why does the government express support for the armed militias which commit terrible crimes against parts of the population and which the (Iraqi) government does not control or hold responsible for the war crimes committed? 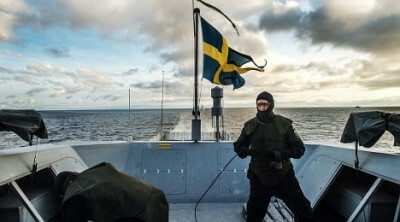 Swedish military should not intervene in the ongoing war in Iraq. Rather, Sweden should invest even more in humanitarian aid to Iraq´s internally displaced refugees, not least those fleeing from Fallujah. Sweden should in the UN and other international organisations lead the way for political and diplomatic solutions and make great efforts so that a national non-sectarian Iraqi unity government comes into existence, a government that works for the best of all Iraqi ethnic and religious groups. Those responsible in the US and in Great Britain must be held responsible for the unlawful attack on Iraq and for the war crimes committed! International law must be defended in Iraq and justice given to Iraq´s people!